Today we’re going to talk about everyone’s favorite summer accessory – the beach bag. It’s stylish, roomy, and meant to hold all of our beachy essentials. What girl doesn’t love a good excuse to pack a giant purse?! The beach is the ideal vacation spot. You can gracefully adorn the sand as you tan your winter whites away or you can hop in the surf for a little fun in the waves. Whatever your beach time habits are, I guarantee you brought along your stylish tote. Since I did a pink segment earlier in the week, I thought it appropriate to tack on pink’s friendly neighbor, blue. After all, those who don’t often wear pink will almost always wear blue. 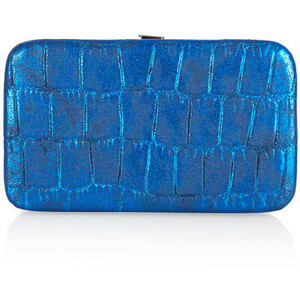 So, without further ado, here are 5 blue accessories to consider pairing with your fall wardrobe. I love these Chanel look alike sunglasses from the FreePeople website. Sunglasses are a great affordable accessory and can add an extra edge to any outfit.